This is a de-lurker award for Cubs fan Betty Jo. If we make Elizabeth a Cub’s fan, what’s more natural than Darcy being a Chi-Sox fan? 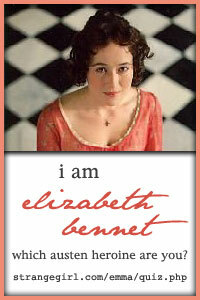 Elizabeth Bennet was ecstatic and was radiating happiness. “I’d ask why you’re so giddy, but I don’t really want to know do I?” Darcy asked. “The schedule came out today!” she replied in a sing-song voice. Darcy mused that the stereotype that only men could be obsessed with sports was blatantly untrue. “You cannot be serious?” he sighed, knowing all the while she was. Darcy slumped in his favorite chair while he considered what she was asking. Elizabeth had long since learned that he had moods and since it was her fault he was in this one, she decided to just let him be for the moment. He just gave a dismissive wave of his hand. She smiled when he did. How complicated she had originally thought he was! He was in actuality very simple. He loved her, he loved his sister, he loved his job and he loved the Chicago White Sox. He was not always the best at communicating his thoughts, but once you understood the four things those thoughts centered on, he was very easily understood. Darcy watched her walk down the hall and just sat in wonder. How had he, a Sox fan, fallen in love with a Cub fan? Moreover, how had they managed to schedule their wedding for the same weekend where they played each other? And she was really only joking when she said she wanted to alter their wedding plans, right? He was still in his chair, casually leaning back with his head thoughtfully resting in his hand when she returned. “Did I forget to mention that the series this year is at U.S. Cellular? I did, didn’t I?” she teased as she handed him the freshly-printed schedules. He brightened. “Truly?” he asked as he began to shuffle through the papers which verified it was so. Darcy reached his hand out and Elizabeth came forward to take it. He pulled her into his over-sized baseball leather chair. She wrapped her arms around his neck and made herself comfortable in his lap. They both laughed and begun to discuss the merits of using a different kind of diamond for their wedding. The Friday night game served as both bachelor and bachelorette party. Beer, peanuts, cotton-candy, hot dogs and soda flowed freely as Elizabeth and Darcy shared the joy of their upcoming marriage with thousands of fellow Chicagoans. Saturday dawned bright and clear. It was a spectacular day for a wedding. The groom wore a traditional black cut-away morning coat. His vest was, of course, white with black pin-stripes. The bride wore a traditional gown which was everything lovely. Her hair was trimmed with orange zinnias and blue delphiniums and she carried a bouquet of orange and blue roses. They were wed at home plate prior to the singing of the National Anthem. William’s family shrugged it off as another one of his eccentricities while Elizabeth’s knew better. Included in their vows, along with the traditional for-better-or-worse, sickness-and-health, till-death stuff, was a promise to never gloat about whose team was superior. Mrs. Bennet could be heard loudly lamenting that her heedless daughter at least had the good fortune to marry a man that didn’t seem to care that she was a senseless tomboy. After the wedding, the newly-minted Mr. and Mrs. Darcy took their seats behind home-plate and proceeded to begin their marriage by sharing in America’s favorite pastime together. Elizabeth and William were rooting for opposing teams, of course, which was not surprising for anyone who happened to know the headstrong couple. When the game was over, they each were grateful for the addendum to their vows as it would do no good to begin their honeymoon by taunting the other mercilessly. Still dressed in their wedding clothes, they attended a small reception with their families at Harry Carey’s. It was William’s great concession to Elizabeth, since the games were on his home field, the reception was in hers. That Harry Carey’s had some of the best steak in town didn’t hurt much either. They celebrated with their loved ones until the wee small hours of the morning and then made their way home where they continued their celebration in a much more private manner. While attending the Sunday game, for the first time either could recall neither of them was able to pay much attention to the game itself. The distraction that each created for the other was too strong and for the first time, they left without knowing the final score. The Darcys did continue to be rabid baseball fans throughout their lives. Darcy always rooted for his Chi-Sox and Elizabeth for her Cubbies. They did still tease each other often about their preferences. She would dig and call them the dirty Sox which always prompted Will to, yet again, rail that Shoeless Joe was framed and he would annoy her with accusations about how they hadn’t had a decent player since Ernie Banks in the sixties. Despite this age-old battle, the Darcys lived with unusual felicity in their marriage. They even found common ground and began to root for the same team. William still loved his Sox, and Elizabeth still adored her Cubs, but the Darcy’s new favorite team was the Seattle Mariners. What had caused this change in team loyalty? The new pitcher for the Mariners was Andrew Darcy, their eldest son. Andrew had a very successful baseball career, even winning a World Series near the end of his career. He played for many teams, but would never entertain any offers from either the Sox or the Cubs. He could never do that to his parents. Happily, the Darcy’s teams each eventually had the ultimate in success. William was able to cheer his Sox on to a Series win in the 2020’s. It took Elizabeth’s Cub’s a bit longer, they didn’t make it until 2031 but she believed it was worth the wait. In the end, as long as William and Elizabeth remembered it was only a game, everything worked out well and for the best. They, like any other couple, or perhaps even more so, still fought and argued. Yet they knew that the love they shared for one another was strong enough to weather any storm, even a bad baseball season. Take Me Out to the Ball Game by michchick aka Jennifer Hickling is licensed under a Creative Commons Attribution-Noncommercial-No Derivative Works 3.0 United States License.